"The American Automobile" 1950s car magazine. Homepage. This page: A US motoring title aimed at people involved in the motor trade during the fifties. The American Automobile, March 1957. 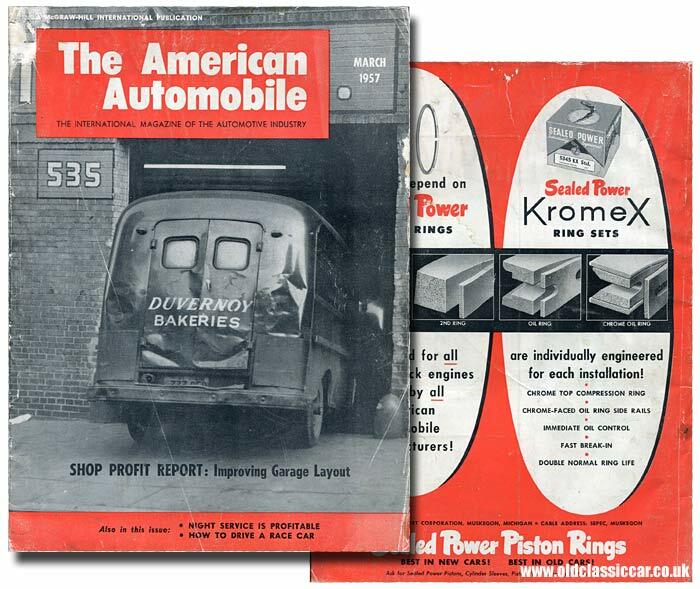 This publication from 1957, simply titled "The American Automobile", billed itself as "The International Magazine of the Automotive Industry". On its cover, a battered panel van belonging to Duvernoy Bakeries is shown, nosed into a garage (perhaps it was to be fitted with larger rear-view mirrors!). Published by McGraw-Hill, this was a monthly publication, the March 1957 issue being No.3 of Volume 34, suggesting that the magazine could trace its roots back to the early 1930s. The editorial is written very much with motor trade readers in mind, the headline article being one that discusses the ideal layout for a commercial garage, or "shop". The article itself begins on page 33, and is headed by two small images. The first portrays a view of Coliseum Motors' workshop in Ballarat, NSW, Australia, where a line-up of cars is being worked upon within a long narrow building, each stall having its own door to the outside. Each stall, or bay, had a microphone linked to a public address system which in turn was linked to a clocking in/clocking out machine. It was estimated that nine hours were saved in one day alone, by mechanics not having to make trips to and from the manual system. The car nearest to the camera is a sad-looking Austin A40 Devon that, judging by the damage to its nearside doors and roof, had been on its side at some point. A second snapshot shows the neat layout to be found at a Pontiac dealer in Alabama, the Canon Motor Co. Here doors were set into both sides of the building, allowing for a narrow central aisle, and better use of the available floorspace in the workshop. The article discusses some successful workshop layouts, looking at not just the arrangement of the floorspace, but also of sales counters and dealer showrooms, two very different environments that often require contrasting appoaches when it comes to layout and the use of space. Light too is given consideration, especially as the author believes that poor lighting tends to lead to slower working, not good for a commercial operation and, in extreme cases, could lead to mistakes being made. The working bay for a typical American car of the day should not be less than 22.5ft by 10ft, while body repair bays would need to be a little wider. Several pages then follow, incorporating suggested designs for a re-modelled or newly-built workshop, taking into account the flow of vehicles, workers and customers in a typical workshop or showroom environment. Photographs of different buildings, in the US and in Europe, are shown, some using "before" and "after" shots of a re-developed site for comparison. The building shown below was a Nash dealership (P.K. Williams Nash Co.). Unsurprisingly, The American Automobile is packed with advertisements relating to vehicle maintenance, with relatively few advertisements for new vehicles themselves. 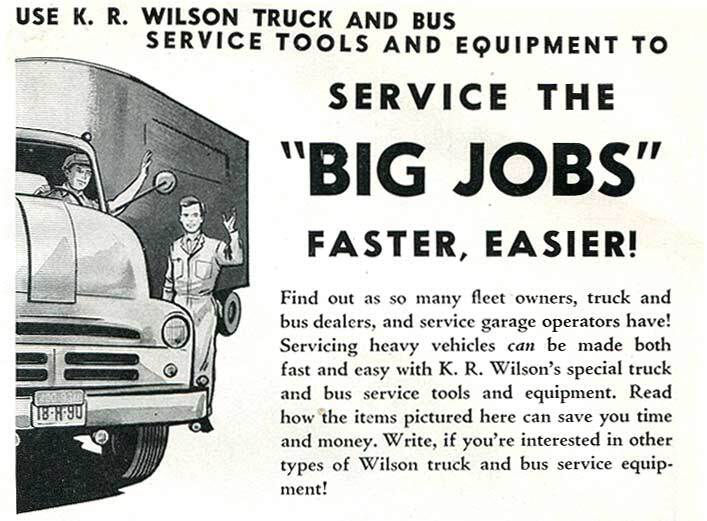 In fact only adverts for DAF sales and service, the Jeep FC-150 (Forward Control), and Dodge-DeSoto-Fargo trucks appear within the magazine's 100 pages, the remainder are for tools, parts, services and accessories. Brake linings, engine valves, transmission components and tyre re-treading machines (called "top-caps") all feature. 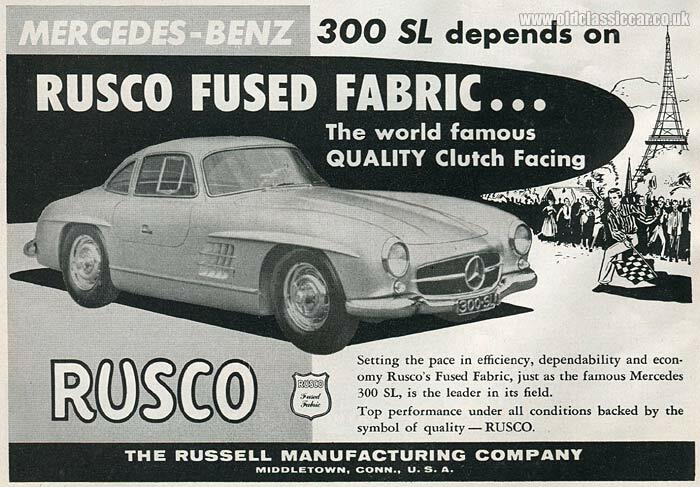 Perhaps the most eye-catching ad of all is for Rusco Clutch Facings, and features a European car - in the lithe form of a Mercedes-Benz 300SL - rather than a home-grown product. They were keen to associate their products with the apparent glamour of Europe and its products, hence the choice of the "gullwing" Mercedes and, curiously, the Eiffel Tower in Paris. The letters page is quite interesting, in that it highlights how international the readership was. A chap in Peru for instance writes about his plans for a new workshop in Lima, while Herbert in Bolivia communicates his approval of "El Automovil Americano". Mr Rozner in Israel expresses his surprise, on inspecting his Jeep delivery vans' engines after 30,000 miles of use, that oversize pistons are installed by the factory from new, in his case +.020". Jose in Ecuador asks for advice on re-furbishing his car's fuel pump, but omits to mention the actual car he's working on, while Narciso in Argentina asks about the materials that go into the production of ignition points. Other correspondence made its way to the magazine's New York offices from Alaska and Mexico, but none from the US towns and cities that I'd have expected to find mention of. Following on from an article regarding the improving designs of chassis used at Cadillac, is a review of the new Ford pickup trucks for 1957. The range included the "Styleside" truck, which offered increased loadspace thanks to the design of rear bay which extended to the outermost edges of the vehicle, wrapping over the rear wheels, rather than upto the inner edge, as on traditional "flareside" vehicles. A wraparound windshield was standard fitment. Larger tilt-cab trucks would also be offered, as would the Ranchero, which combined elements of the Fairlane's saloon-car design, with a handy rear pickup loadbay. Excellent carrying capacity was also on offer with the Packard Clipper sedan and station wagons. The former was a re-worked version of the Studebaker President Classic, with the added benefit of supercharging, while the station wagon was based on the Studebaker Broadmoor, again with a supercharger (lifted from Stude's Golden Hawk). Packard's own V8 engine, coupled to Ultramatic transmission, had been consigned to the history books, replaced by the Studebaker Golden Hawk's s/c 275bhp V8 and Flightomatic transmission. The News sections bring the reader up-to-date with latest trends and developments, especially as the Suez Crisis was predicted to lead to production slow-downs across Europe, and possible fuel shortages. New York City was planning to introduce helicopters in a bid to improve the city's bus service, the idea being that advance news of traffic hold-ups and road repairs, accidents etc could be fed back to central headquarters, and relayed on to individual buses, so that routes could be altered in real-time to improve flow. The launch of Ford's new Edsel was still some months away, yet the marketing department was doing an excellent job of drip-feeding news to the press, to build up interest in the forthcoming model. In 1954 the company undertook tests on current cars to establish how easily they could be identified from various distances, such as one city block away, and from the top of a ten storey building. The conclusion was that cars couldn't easily be identified from one another at these distances. Because of this, the manufacturer was "...working on a car which will be easily recognizable from any angle". The Edsel was launched on 4th September 1957 and would certainly prove to be instantly recognisable, but not necessarily for the right reasons, and proved to be a commercial flop. New accessories for the motorist. American cars were rarely lacking in the gadget department, yet there were plenty of companies designing yet more accessories that could be retro-fitted to cars and trucks. The American Refrigeration Export Company heralded the launch of the new Coldmaker automobile fridge, designed for installation below a car's dashboard. The Haldex Speed Pilot from Sweden enabled the driver to manage his speed, distance and duration of travel, and would prove to be a boon in road-going competition, rallies etc. Designed very much with garage businesses in mind was the snappily-named Barrett Shu-Strip-R "Twenty Five", a large standalone machine which enabled swift removal of bonded linings from brake shoes, at the amazing rate of 2,400 per eight-hour working day. Burning or grinding down old shoes could be avoided, with the obvious health benefits for the (un)lucky individuals tasked with this unpleasant job. How long this magazine was produced for I've not been able to establish. There are few references to the title online, but maybe more information will turn up in time, in which case I'll update this page. I'd recommend searching out some copies of this magazine to anyone interested in American cars of the 1950s. Another trade magazine hailing from America to feature on the site, this time from the 1930s, is MOTOR, of which more can be found on this page.